A scatterplot is a useful visualization that compares two series of numbers against each other. This can be great for determining a correlation between the series. 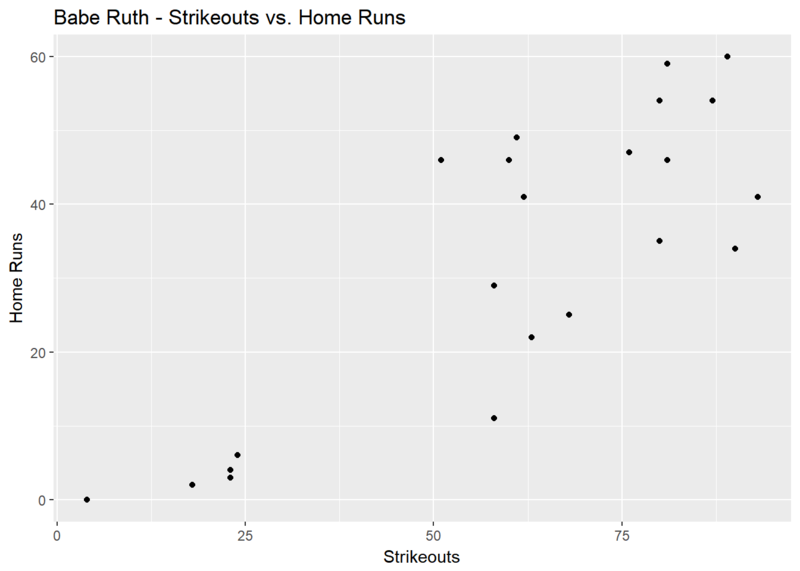 In our example below, we will compare Babe Ruth’s career home runs against his career strikeouts to see if there is any relationship between how many home runs he hit and if that means more strike outs. First we need to import our libraries and gather our basic data. Here we just need the home runs and strikeouts for each year. Next up we need to use ggplot to create a scatterplot and define which number series is on which axis. Now we want to see if the correlation is the same for all great home run hitters in baseball history. Here we will need to expand our dataset as well as make our scatterplot interactive with ggiraph. Now we can plot the points and use the ggiraph library to make the points hoverable and interactive.